The Duke Nukem Forever demo isn't just for people buying Borderlands' "Game of the Year" edition anymore. Last week, we learned that Gearbox would be including a key to the Duke Nukem Forever First Access Club in every copy of the Borderlands GOTY edition. As it turns out, Gearbox is making good on its stated intent to get the demo out to as many people as possible: If you're already an owner of Borderlands on Steam, you're getting the Duke, too. Readers over at Kotaku noticed that they had a shiny First Access Club key attached to their copy of Borderlands on Steam. Others have confirmed that they have the same - whether you've bought any of the existing Borderlands DLC or not. 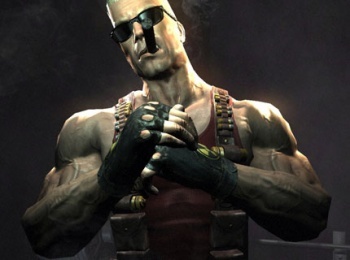 It really does seem that Gearbox is intent on letting as many gamers as possible know that "Hey, Duke Nukem Forever is actually being made, it's actually coming." It's a shame that they don't really have any feasible way of getting the demo out to people who bought Borderlands on consoles - how would you prove that they actually bought the game and weren't just renting it or something? Still, I did buy and play Borderlands on Steam, so looks like I'll be getting my hands-on time with the Duke early enough. Not like that. Minds out of the gutter, people.